Some people say an iron is an iron. To me this is certainly not the case. I need to use an iron at least on a weekly basis but sometimes more. I have to make sure my husbands clothes are pressed and wrinkle free for his corporate job. Price wise the iron was what I would consider on the cheaper end given it had the master in the name, leading me to believe it was more of a professional iron. I could have spent the same amount of money towards a more expensive iron however and gotten one with better quality. I have used sunbeam for quite some time so I of course trusted the brand. This was the first one I was severley disappointed with however. I ended up returning it to purchase a different product and I don't know that I will purchase a sunbeam again. First off, I had a problem with the retractable cord. It did work most of the time, but you had to play with it a lot. Pulling the cord back out and trying to get it back in several times. The cord would only retract a small amount at a time before stopping and leaving the rest of the cord hanging out. I eventually got tired of trying and just wrapped the cord around like my old iron. I also didn't like the material the iron plate was made out of. It wasn't a steel plate like I was used to. It is suppose to be nonstick which is a great idea. 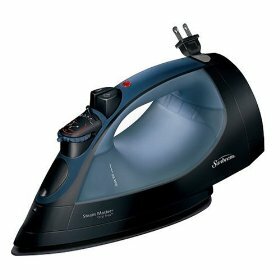 I have had many irons that over time got buildup on them and it would burn on causing the iron plate to get pastey and sticky when it was heated up. I figured yay, this wouldn't happen any more. It doesn't get pastey and sticky but it does stick to your clothes while your trying to iron them. It doesn't just roll right over them like a typical iron. It is like the iron has static cling and its stuck to your clothes. I did like however that you could steam your clothes while they were still hanging. This was great if say a shirt just has a few wrinkles and it doesn't need to be ironed really. Wicks the wrinkles right out and can save a lot of time. That being said, you're better of just buying a steamer since it isn't really worth it to purchase an iron that doesn't iron well at all. Overall not a very effective iron and more annoying than its worth. Ironing is an excruciatingly boring task and this iron just makes it take longer.